Gosh that sounds like a fascinating post title don't you think?? Well it only took us an entire year to actually get ourselves organised !!!! 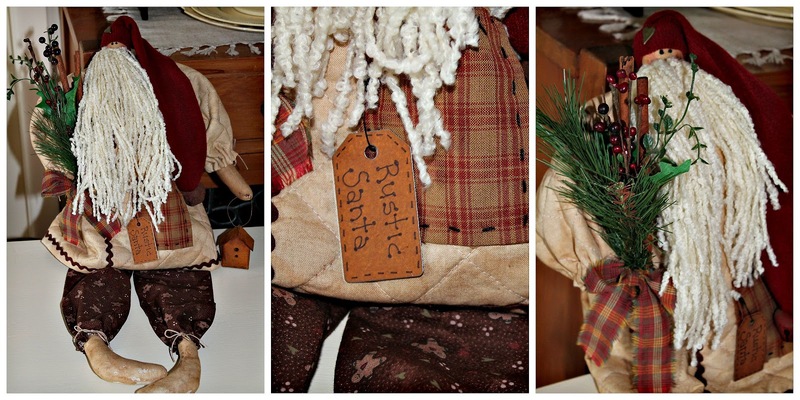 I have a homemade Rustic Santa of my own (several christmas's old now) & just really adore him when he comes out each year at christmas time. My friend Leeanne's parcel arrived this week - her timing was perfect as it was "one of those weeks" ... this is the amazing, generous package that Leeanne put together for me . . .
Oh there were some choccies in the parcel but Blackie must've sneaked in & stolen them !!!!! I have a couple of Leeanne's stitcheries now - she does such beautiful fine detailed work, I just adore them. She especially loves winter-time so the snowman theme was appropriate. I hauled it out this past week & gave it the wax candle & paint treatment ... I have been working on some painting projects in front of the fire these damp wintery days.
. . . then the fun part ... embellishing & "doiley-fying"
Goodness what IS that stuff shining in my bedroom windows .... Oh yes, its sunshine !!!! We just haven't seen any for awhile around these parts ! ! Then I got to "try it out" to make sure it all actually worked okay !!!! It is going for sale in my Cottage so will be useful to have some magazines in it, for those customers that will ask me "what do you actually use this for ???!!! And as for Blackie . . .
... well he's being his kind, caring & understanding self ! ! ! Gosh, where on earth did July slip away to I ask you ??? 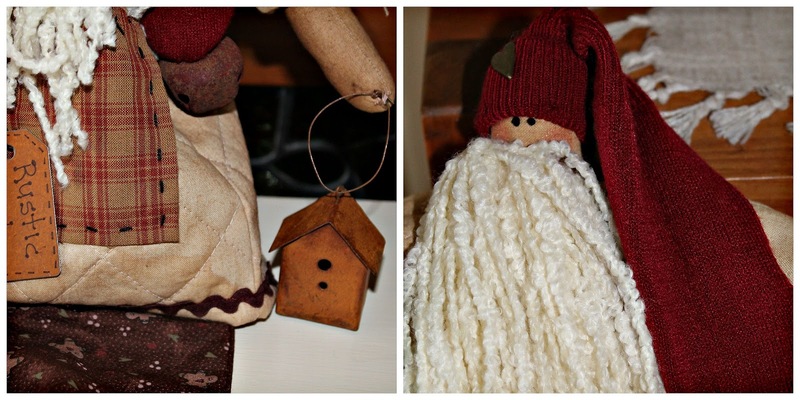 Your Santa is absolutely adorable and so creative. What a lovely package you've received too. I really love what you've done with the magazine rack, it's great to see something salvaged and upcycled. Poor, sweet little Pippi. She's such a cutie and I hope she heals soon. I think Blackie's gorgeous, too. When I was a little girl I named my cat Blackie. She used to sleep on my bed at night, sometimes with her head beneath my chin, and we'd wake up in exactly the same position each morning. She gave birth to her kittens on my bed too, which, at the time, seemed really disgusting (I was about 6 or 7), so I stopped letting her into my room after that. I do enjoy your "ramblings" as you call them Yvonne ... thanks so much for taking the time to drop by & leave your lovely comments. Pippi is coming along okay I think - she must've been feeling a bit brighter today as she whined & carried on all day to be let outside - which I am not allowed to do yet. Its hard work being Pippi's Nursemaid. Poor little Pippi - hoping she is much better soon. 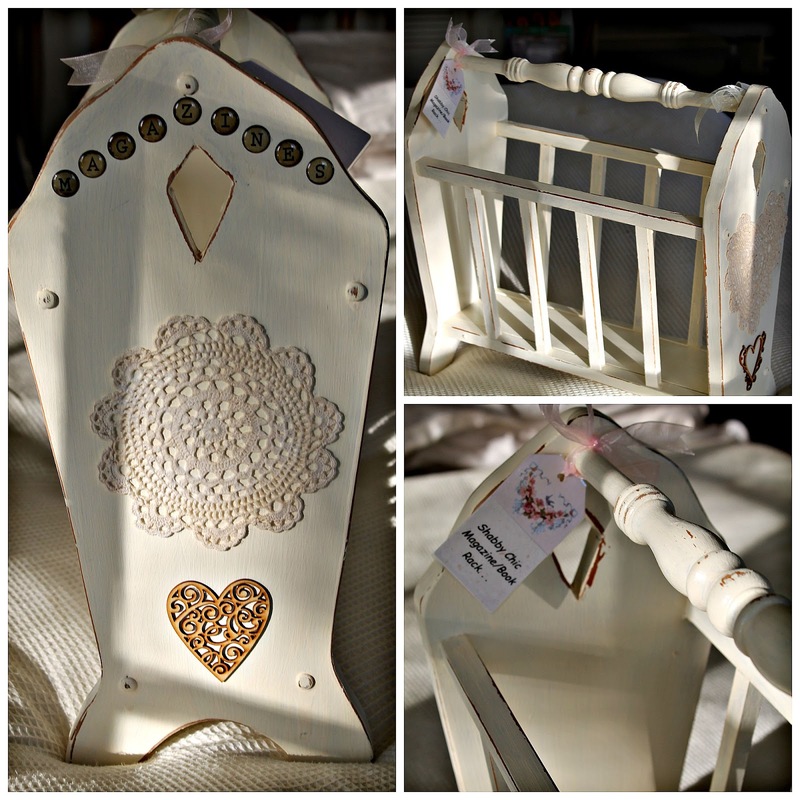 The magazine rack looks so much nicer now - love the heart shaped dollie. 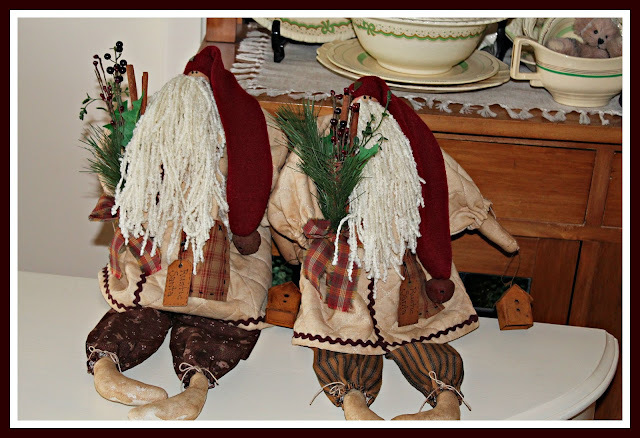 Love the rustic Santa's - you have done a wonderful job making them. Ah! Bless! Poor Pippi....! Hope she heals soon...! Drains? Drains? HeHe! Lost it there l think! :). 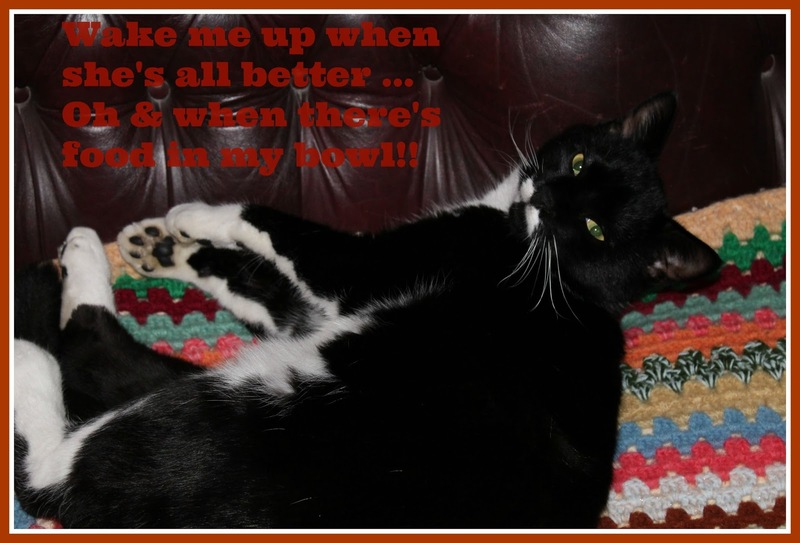 Wake me up...and food in the bowl! alright l suppose, but...'Nowt like a cat'. Love the the Santa's...Especially the beards...They look great. Very Characteristic and certainly seasonal...Lovely! Your goodies are gorgeous, Julie. You are a lucky gal. 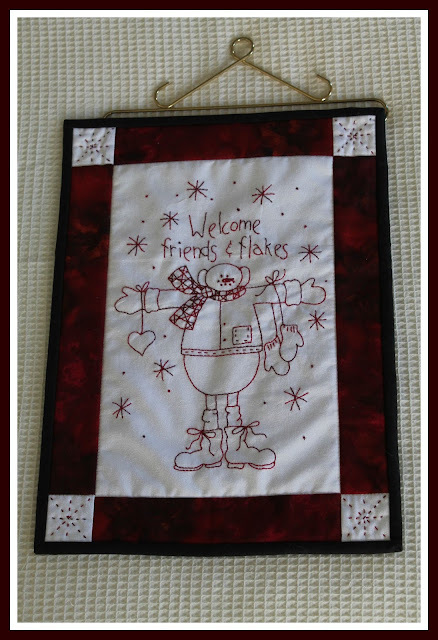 Those Santas you have stitched are gorgeous. They add such a homely and rustic feel to your lovely home.I love those 5% off days at the op shop, too. You have done wonders with the magazine rack. I can't imagine this sitting too long in your cottage; it will be snapped up in no time at all. The sight of a lick (or two or.......) of white paint on furniture that is distressed puts a little puts a smile on my dial. 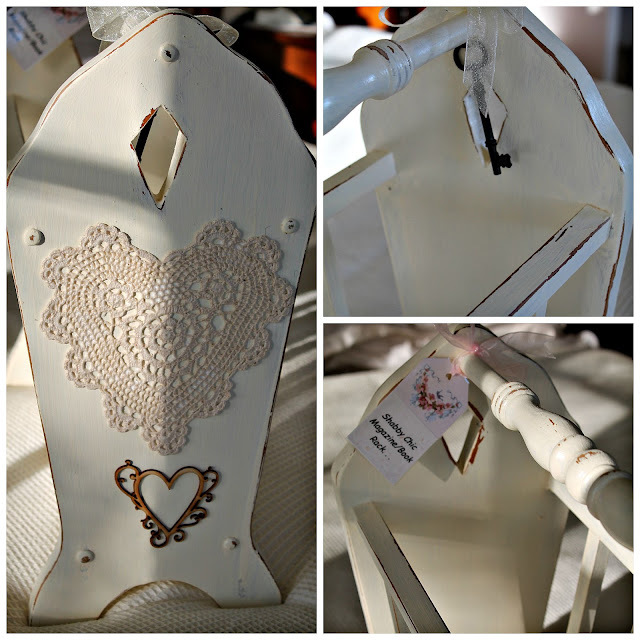 I love the addition of the doilies and the hearts; they finish the magazine rack perfectly. Doesn't Pippi look so comfy in that basket......as as for your Blackie.....well he has the look of one contented and mischievous cat..
actually got some here today in West Oz. Had heaps of rain too. out.....er.....to make sure it works. Your Christmas swap looks fun Julie - love the Santas that you made - just looking at them gets me in the mood for Christmas!! 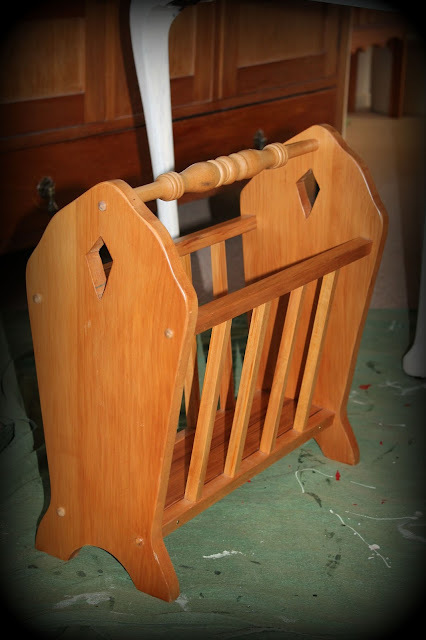 Clever work on your magazine rack, you've really made it into soemthing special. Special little hugs to Miss Pippa, hope she heals soon...and hope she'll be back to fulltime supervising soon! 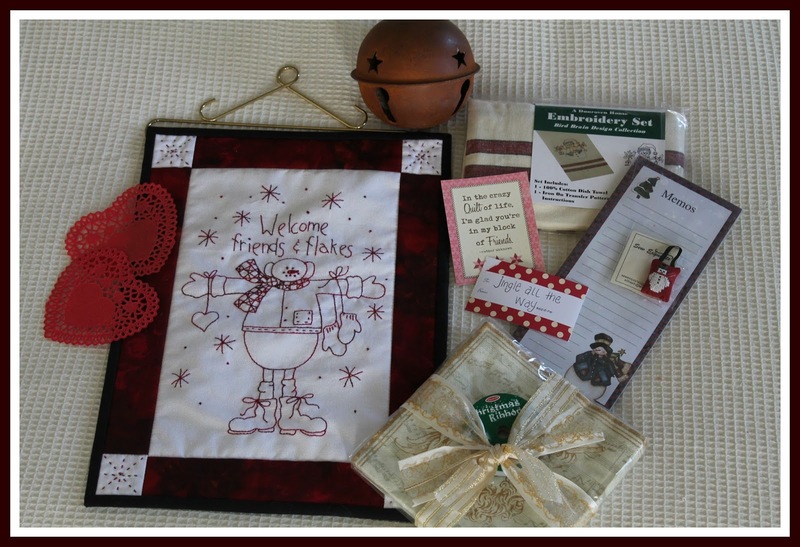 Julie you are so clever and very very crafty and I know that Leeanne loves her Santa!!! Awesome wee man he is. And I just love what you manage to do to items that no one else wants. Hope Pippi is feeling better, and that you have managed to get your pruning done in between the rain and caring for Pippi!! They are amazing Santas!! Your goodies swap from Leeanne is beautiful, so many lovely things. The magazine rack looks wonderful too. I hope Pippi heals soon and is back to her usual cheeky self. oh how I wish I lived closer... what a fun swap to take part in. I am busy here making christmas as well. Oh poor kitty. its been so long since I have had a pet go thru this. The worst was always having the claws taken out. I hope for a fast recovery. Enjoy that bit of sunshine!! Poor little Ms Pippi, she looks like her recovery is going well, and as for the sympathetic Blackie, well he is a bloke and we all know how they think, or is that don't think!! Again you have been wonderfully industrious with your finds. 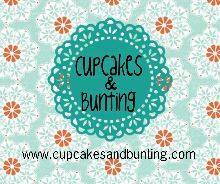 Your wax and paint look is a favourite of mine and I really need to give it a go. 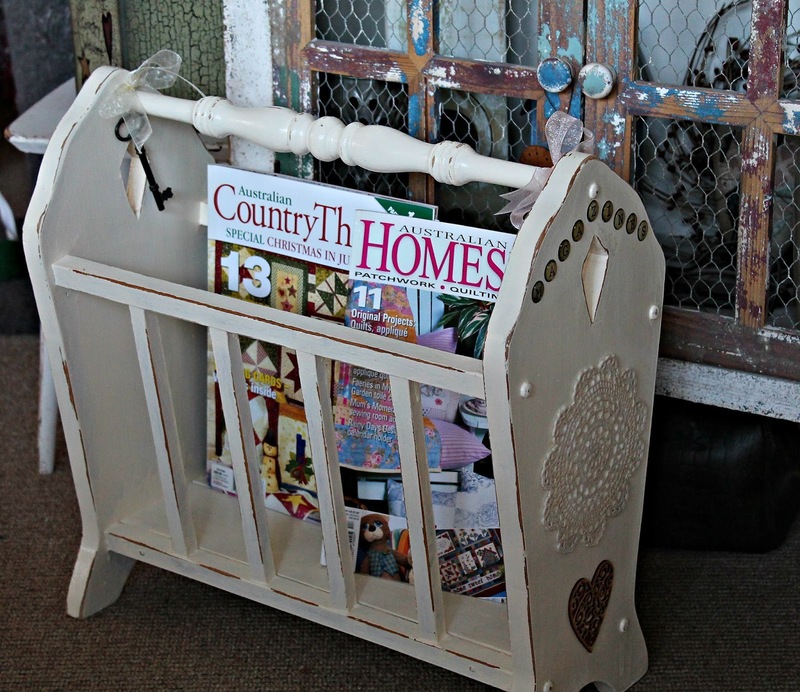 Love your magazine rack...you have such style in your work, Julie.